je suis un mage, ridicule, je geule et je me prends pour le centre de l univers. Qui suis je ? coucou tout le monde, dsl pour l'absence ces derniers jours, bientot nouveau Pc !!! quand le dagon a faim , tout le monde regarde les nains. 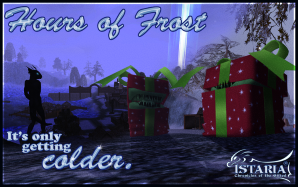 Ce nouveau patch sur le serveur de test apporte les bases du nouvel �v�nement hivernal � venir, Hours of Frost, qui semble remplacer cette ann�e l'habituel Gnomekindle. Cet �v�nement, teas� sur le forum, recouvre Istaria de neige et apporte des paquets cadeau carnivores (vous n'avez pas �t� sages cette ann�e) que vous pouvez apprivoiser et se terminera par un grand final orchestr� par les GM. Les poisons ont �t� �galement encore r��quilibr�s. Edit: Ce patch est pass� directement sur les serveurs r�guliers le 20/12/2016 pour commencer l'�v�nement. - Istaria has been plunged into a quick and cold winter! All across the land, green land has been blanketed in a cold sheet of snow. - Mysterious present-shaped mimics have been spotted popping up everywhere in the world, from the Lesser Aradoth to Harro and the edge of the Eastern Deadlands. Some intuitive Gifted have even managed to take them in as pets. - Superior Antidote now requires a rating of at least 100 to use (instead of level 114). - Updated the Gem Golem spawns west/northwest of the Tower of Healing Canyons. - Primal Alacrity, Primal Health, Gift of Velocity, and Primal Restoration now can be used while costumed. - You must now properly complete The Hidden Dragon: Recovering Knowledge to be able to pick up The Hidden Dragon: Primal Restoration. - Lethal Poison is now even more lethal. - Son of Gigaroth's Entangled debuff now gives a Deadly Poison instead of a Lethal. - Gerix now sells a Sandstone Strength Wing Scale. - Sheep and cows now have properly capitalized names. - Ancient Barasavian Charm now refers to Magic Defense instead of MagDefense. - Aura of the Forgotten now allows you to correctly loot the Faded Souls for their Recovered Memories. - The quest "Memories of the Forgotten (Part 2)" now correctly asks for 12 memories in the quest step instead of 16. - Rift Spirit Form now properly allows you to damage mobs in the Rift. - Rift Spirit Form no longer turns you into a sparkly ghost. Instead, you are now a ghostly version of your own character's design! - Fixed quest "Farmer Idamon's Chicken Troubles" so that the egg step says "Loot" instead of "Collect"
- "Avenge the Fallen" and "Remnants of the Artifact" and "Pacifying the Angry" quests from the Tower of Healing now all give XP and Coin upon completion and have had various fixes and tweaks. - Quest "The NRRI needs your help!" is now "The NRDF needs your help!" - Updated the description and effect of the Pulsing Artifact Fragment tech kit. - Amulet of Istara tech kit now applies a name modification to the item it is installed into, has a correct description, and applies to the proper statistics/skills. - Seal of the Clerical Order tech kit is now fixed and given out as part of the "Avenge the Fallen (Part 2)" quest. - Druid's Growth will, temporarily, only give Lesser Growth until the issues can be resolved. - Quest "Trials of the Gifted: Test of Knowledge" no longer refers to Jarl and has an updated timeline. - Lethal Poison now lasts only 5 minutes and does no recurring damage, but after nearly 5 minutes will kill you if not cured. - Guild: Amon now has an outgoing portal. - Corrected the terrain near one of the Guild: Amon plots so that the plot boundaries are no longer on the cliffside. - Blighted Brambles no longer gives a Lethal Poison, but does damage over time directly.